Home » Blenders & Juicers » Countertop Blenders » Which Vitamix Should I Buy for Home Use? Invented in the late 1940’s, the Vitamix was a niche appliance that was being sold at county fairs and at flea markets. It wasn’t until 1969 that the Vitamix company got their breakthrough. The newly redesigned 3600 was powerful enough to knead bread dough, blend ice cream, grind grain and even make hot soup. The company went public, and the Vitamix hit the open market literally blowing all of the other high-performance blenders away. Now, there are so many models to choose from, both old and new, that deciding can be quite overwhelming. So which Vitamix should I buy for home use? We did a lot of research and chose 6 models that we think are good buys, depending on your budget. Keep in mind that Vitamix does a very good job doing refurbishments on returned units, so if brand new models are too expensive for you, certain refurbished models are very worthwhile and their warranty period is only a little bit shorter than normal. We’ve selected some new ones and some refurbished that have got rave customer reviews. They all cost over $300, so if that’s not what you’re willing to spend, take a look at our picks for blenders under $200. Every Vitamix now has many of the same characteristics that the original 3600 model had just because it was so good. However, every model available today is considered one of the most powerful and versatile in the market. As a testament to their durability, they come with some of the best warranties in the business. Every Vitamix blender features 100% BPH free blender containers, recipe booklets, tampers and a community support network that is second to none. There is one model, however, that is different from all the rest – the Vitamix Next Generation 780 is the newest and most expensive but has had good reviews so far. What is unique about it is its touch responsive control panel that has replaced manual switches and dials. If this kind of high tech blender is what you’d prefer, also take a look at the Blendtec blenders, as that’s what the brand is best known for in the high performance category. Amazon has the full range of available models and their accessories, like smaller jars, dry containers and tampers, but here’s a list of the most popular models, their features and attributes. We end with a short summary of what we think might be the best one for you and your needs. The 2 speed Vitamix TurboBlend gives you unmatched simplicity for virtually any blending chore. This is one of the least expensive Vitamix blenders here, but you’ll still get an incredibly powerful 2 horsepower motor, and a 5 year full warranty. It’s the easiest of all Vitamix blenders available, with just a high and low speed to choose from. The question you should ask yourself is, do you really need more speeds than this? After all, it comes with a full-sized 64-ounce container and will still chop, blend smoothies and even make hot soup because the blades move fast enough to heat the ingredients while blending. There is no pulse button but you can mimic the action by switching the blender from one speed to ‘OFF’ and back. Its locking lid is secure at all times but also easy to unlock and remove and the included tamper ensures there are no air pockets even when blending thick ingredients. The jar is made of high quality plastic and is easy to clean. Put in some water, a drop or two of dish soap, flip the switch to high, and it cleans itself. For an extra shiny look, use vinegar and baking soda mixed with warm water every few uses. The old adage of being able to do more with less, certainly fits the TurboBlend 2 Speed. If you don’t want all the bells and whistles of the others, but you still want a high quality Vitamix blender, this one has to be considered. The TurboBlend stands 20.5 inches tall with the container in place. With 10 variable speeds, a pulse function and a low profile jar that will fit beneath many cabinets, this Vitamix 7500 G-Series will do it all, yet not break the bank. It features a 2.2 horsepower motor that will crush ice with the best of them, and it comes with a big and easy to grab handle to lift even the heaviest blended delights. Users love that they can completely control the speed with this model from 1 to 10 along with a pulse feature, so experienced cooks will like this model a lot. Newbies might take a while to figure out which speeds are best for which tasks and you’ll have to remember or write down which speeds to use the next time you make the same dish. This was one of the first units to feature a 17-1/2″ low profile container, which gives them greater stability and makes them easier to store. Yet even though it is low profile, it will still hold a very respectable 64 ounces of smoothies, frozen desserts or whatever else you care to blend. The included tamper is also designed for this short but wide jar and even single serve smoothies will get fully pulverized. This is a very dependable unit, and to prove it, it comes with a 7 year full Vitamix warranty. Note: Earlier customers have reported black particles being released in the first few uses of this model, but the company seems to have addresses this issue, as more recent customers have said that they do not see any particles in their mixtures. The Vitamix 750 gives you all the goodies from the 7500, and then adds a few more. It also has a low profile container, but it has a rubber lid with a removable plug so that you can add ingredients easily during the blend cycle. That just makes it a little more convenient when blending. The 2.2 horsepower motor is easily up to the task, it has 10 variable speeds plus pulse feature that you can select, but it also has 5 pre-sets which include smoothies, hot soups, purees, frozen desserts and a unique self-cleaning function. So cooks that like to experiment can take full advantage of the speed dial, but when they zero in on the perfect speed for certain foods, they can use the presets to save them time in the future. You have to pay more for this versatility, but you may find that it’s worth it. The self-cleaning preset is something many customers love. It comes with the standard Vitamix 7 year full warranty for total peace of mind over the long haul. The refurbished Vitamix 6300 standard is labeled as 1888, 1889, 1890 or 1891, depending on the color and it’s one of the best refurbished models that you can buy, so you can save a lot of money (the brand new one is priced at $599) but still get a quality blender. It has the classic tall blender container, so don’t expect it to fit underneath your cabinets. That said, it will still hold 64 ounces of whatever you desire to blend, including nut butters, and the 2 horsepower motor will give you all of the power you need. You’ll get 10 variable speeds, a pulse switch and 3 pre-sets, one each for smoothies, hot soups and frozen desserts. That makes it versatile as well as easy to use. Just use warm water and two drops of dish soap and run on high to clean the jar. Refurbished means that the base is the same and the blades are sanitized, but the jar, lid and tamper are brand new. The 5 year full warranty should be ample for the long run even though it is not the 7 years that you get with brand new units, and this is one of the better values along the entire Vitamix line. If you’re looking for the blender that does nut butters best, you may want to also look at the KitchenAid Torrent. The Vitamix 5300 has the low profile container, 10 variable speeds with an included pulse function, and a big 2.2 horsepower motor. Better still, this motor is commercial grade, so it will hold up better under the most demanding blending jobs, which makes this a better unit if you are chopping ice or kneading bread or cookie dough. If you are looking for the best bang for the buck machine here, and the biggest motor available, this one qualifies. In fact, there are almost no negative reviews of this unit from its customers! Besides the type of jar used, the other difference between this and the refurbished 6300 above is that this does not come with preset functions. However, this one is cheap by Vitamix standards, so that’s not that big of a deal! The Vitamix 1709 CIA model comes with a commercial grade 2 horsepower motor, and it’s backed by a 7 year full warranty. It has the tall 64 ounce container, which gives it a more classic appearance. The 10 variable speeds will give you enough versatility for virtually any blending or chopping task, the vented lid has a removable plug for adding ingredients, and the patented tamper goes through this plug hole to prevent it from hitting the blades while on. The CIA in the title stands for this unit being endorsed by the Culinary Institute of America. This is the blender they use to train future chefs on, and it is a staple in their kitchens. One reason is that this is the model that can replace your food processor if you’re looking to reduce the number of appliances in your kitchen. That is some of the best proof available that Vitamix produces one of the highest quality blenders made today. Even the CIA recognizes excellence when they see it. With every Vitamix model, there are advantages and unique features that may make one better for your specific needs. We’ll go over some of these to help you make the best decision for your application. If it’s all about the best bang for the buck, the Model 5300 has got to be at the top of your list. The low profile container, 10 variable speeds and 2.2 horsepower commercial grade motor, all done at a competitive price, says it all. If you are a true kitchen connoisseur, the Vitamix 750 and the Vitamix 7500 models are the best available for your needs. If you love the idea of hassle free pre-sets, choose the 750 model. But if you want to save about 100 bucks, and can live with just 10 variable speeds and no pre-sets, choose the 7500 model instead. If you are interested in the best smoothie machine, the Vitamix 6300 comes out on top. Not that any of the models won’t do your smoothies proud, but this is the least expensive model with a smoothie pre-set, so you can load it up with fruit, milk and ice, hit the button and let the machine do all of the work. 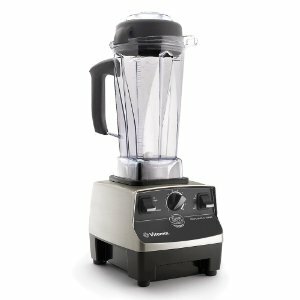 If you want just the basics, and the least expensive unit available, then the Vitamix TurboBlend 2 Speed fits the bill. You can do anything any of the others can do, but it will take a bit more time and some trial and error. But really, the 2 horsepower motor is up to anything you throw into the container, and even the 5 year warranty speaks of high quality. If an award winning, 2 horsepower motor backed with a full 7 year warranty is good enough for master chefs, then it should be good enough for you. The Culinary Institute of America knows a thing or two about blenders, and if the Vitamix CIA Professional works for their needs, it should far surpass yours. This unit is as close to an actual food processor than any of the others, and that’s a big reason for the CIA recognition. Although one of the most expensive units here, it is built to last no matter how tough or how often you use it.